It's been a while since I last posted here - I am still in Europe (it's my last week!) and I took a break with my Mr. to visit Amsterdam and Copenhagen. A-M-A-Z-I-N-G. I am very happy however to share a few pictures of my course at Lesage, the Parisian haute-couture embroiderer (part of the group that owns Chanel). 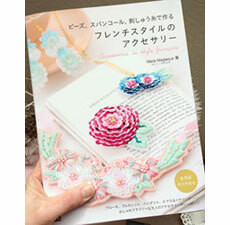 I have taken a one-week course last July, choosing three different projects to be completed during the class. The #1 was the easiest as it was only needle work with beads and paillettes, using a tambour embroidery. Easy peasy. The project #2, a butterfly, was much more challenging as I had to learn to use a crochet de Lunéville. It was the very first time for me to use it and it requires a lot of patience and practice to fully master and start enjoy working with it. Needless to say, the first 12 hours weren't a piece of cake and I got frustrated more than once! 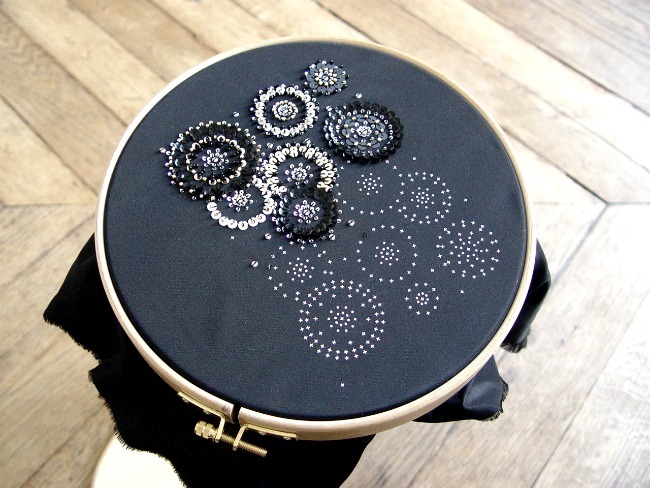 A crochet de Lunéville is used to apply paillettes, sequins, beads and bijoux (and more) to realize a broderie d'art (=art embroidery?). 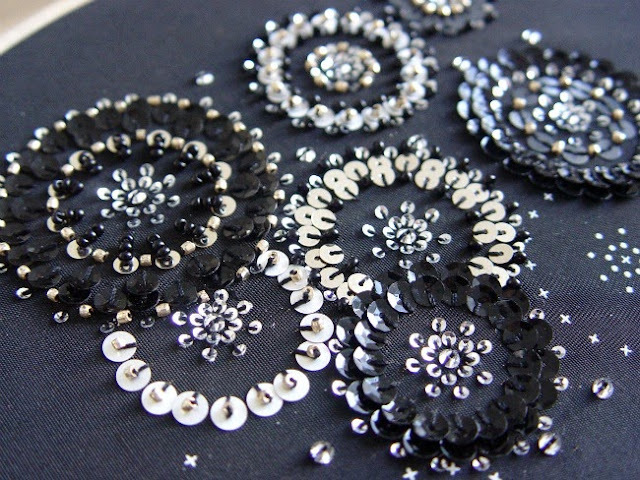 In short, a piece of art embroidered on clothes or accessories. The piece of fabric to be embroidered is fixed on a métier à broder, a wooden frame of a flexible and bigger size than a regular tambour (length of about 1 meter). Then using a crochet de Lunéville, I started to work on my butterfly, first practicing on the side of the fabric how to use the hook to fix beads then paillettes (=sequins). This video by American teacher Robert Haven explains the method very well, and you can clearly see the difficulties involved... I found that the beads were much easier to work with than the sequins. 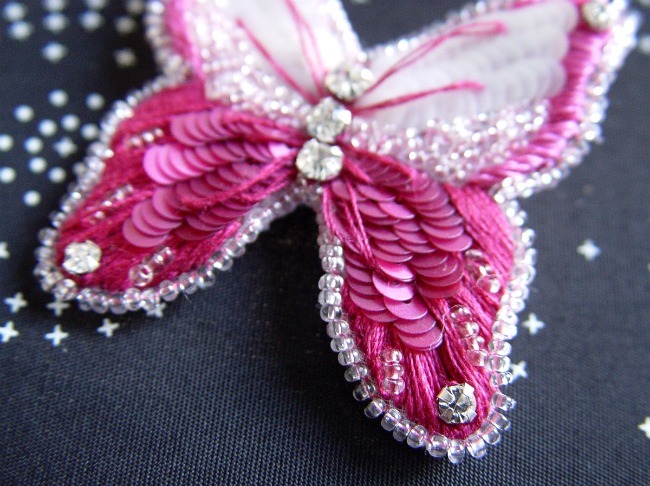 The pink silk thread was applied with a needle - the stitch is called a passé plat (=satin stitch). 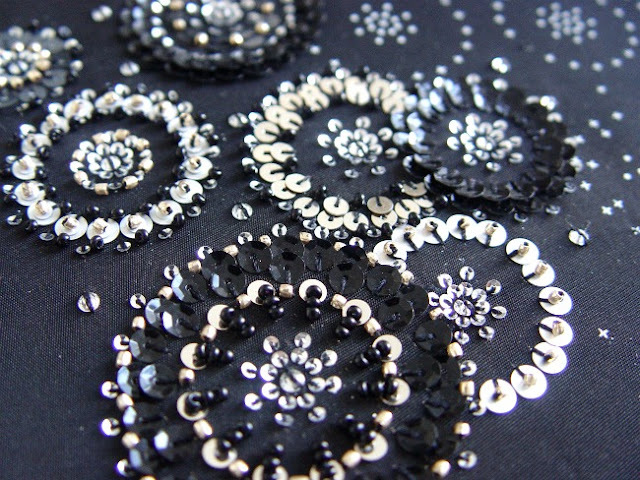 The Swarovski bijoux and the beads ponts (=bridge, 3 to 4 beads sewn on top of the satin stitches) were also applied at the end using a needle. I struggled a lot to apply the paillettes and it took me hours to produce a very average coverage of my butterfly. Eventually the teacher noticed that I wasn't holding my crochet properly, and once she corrected me I was able to work at a faster pace. 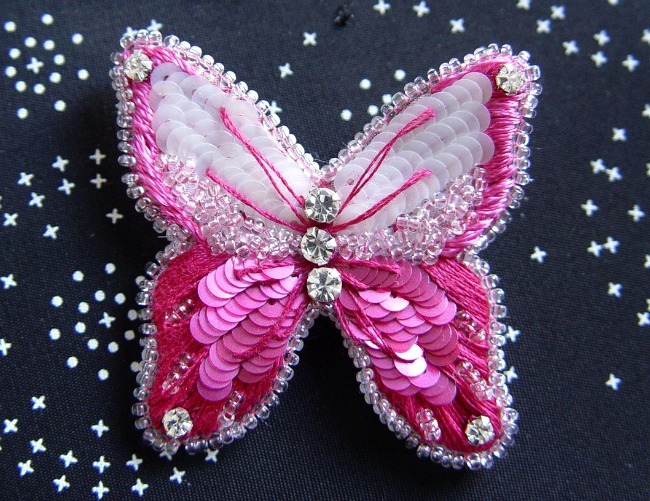 The butterfly was then made a a brooch. The whole project took 12 hours to complete, with no extra work at home (I didn't purchase the frame so I couldn't bring "homework"). Now a word about the class and the overall atmosphere: I spent one week at Lesage, studying for 3 hours every morning and afternoon there. There were two classrooms with about 6 to 8 students, everyone working on a different project, and following their own schedule. There were students from France, Japan, Korea, USA, Hong Kong, The Netherlands... and some of them were taking the professional course - 150 hours to learn all of the techniques. Students told me it requires the quadruple amount of work at home to keep up with fast pace of the course. It looked hard but stunning! 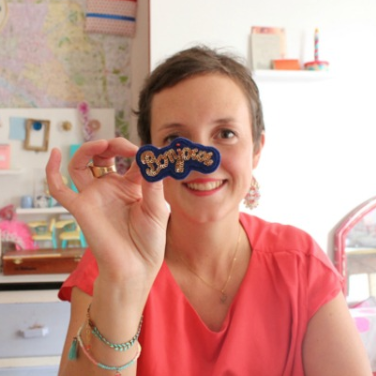 Teachers are all professional embroiderers, most of them working at the Lesage ateliers the rest of the time. It was mesmerizing to listen to their stories about their work for the Paris haute-couture and prêt-à-porter shows and the somehow high expectations of the star designers (think Chanel, Dior etc...). Most of them don't speak a very good English (if not at all), but I didn't find it was a big issue among the students who weren't able to speak French. They managed to communicate quite well, showing what to do and repeating the instructions as often as required. 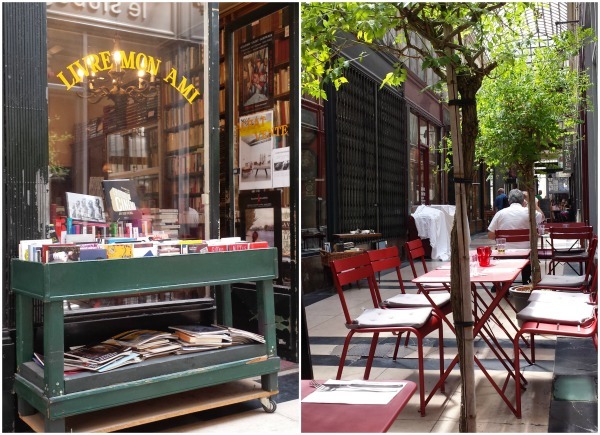 If you attend the school and need a good address for lunch, I would like to recommend The Stube, a restaurant located in Passage Verdeau with set lunches that are both delicious and reasonably priced. Save some space for dessert too! If you are craving for French food, there are plenty of bistro around and many more options in the side streets. I worked on one more project at Lesage, practicing the same techniques as for the butterfly, but I will unveil it later on... Stay tuned! 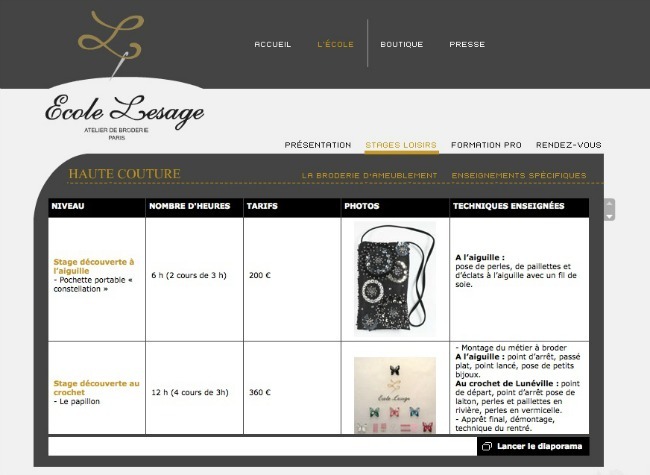 If you want to read about someone else's experience at Lesage, you can visit this link. Enjoy, I hope it will entice you to give it a try! Gorgeous is an understatement!! I LOVE LOVE LOVE LOVE LOVE - especially project #!.